The Permasense wireless Integrity monitoring system uses state-of-the-art technology to continuously monitor pipework wall thickness in real-time. The system is employed in onshore and offshore facilities, as well as in both upstream and downstream sectors in the oil and gas industry. Now implemented worldwide, Permasense pioneered this technology to better inform oil and gas producers and processors on the integrity and erosion or corrosion rates of their pipes and pipework in service. Permasense sensors are designed to be permanently affixed to any area of interest, for example, where high erosion or corrosion rates are expected or in difficult to access locations. They are battery-operated, providing maintenance-free operation for up to ten years. The sensors use a wireless mesh network for transmitting measurements to the desks of integrity personnel, whether they are offshore or onshore, and are designed to work in harsh environments and remote locations, such as offshore unmanned platforms. The insight gained from a real-time understanding of the integrity of the interior of pipework provides a competitive edge over facilities that don’t have this information. Permasense systems give an accurate reading that allows plant managers to know if they need to mitigate corrosion or erosion attack or are able to operate more aggressively, for example by producing at higher rates or extending integrity operating windows. In remote, unmanned platforms, detecting and monitoring corrosion and erosion levels can be an expensive operation. 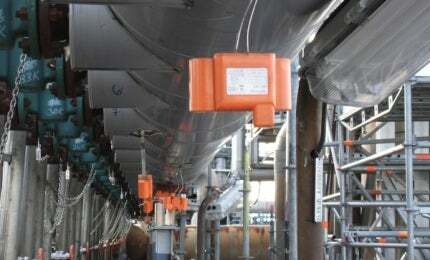 By using Permasense sensors to monitor corrosion and erosion of pipework, platform engineers have a cost-effective method to get a better understanding of their assets’ integrity in service. Pipework maintenance activities can be better informed and therefore more effective, improving availability and reducing unplanned downtime. In the oil and gas industry, it is all about clients getting the most from their resources while minimising costs. Permasense provides operators with the knowledge they need to make better informed decisions that extend far beyond traditional asset integrity management decisions. Oil and gas producers need to leverage their assets as far as possible, increasing production rates whilst minimising downtime. Corrosion and erosion cause continuous problems and understanding how they are impacting facility infrastructure can mean the difference between operating efficiently and unplanned downtime. The Permasense system is fast becoming the cornerstone of pipework integrity management in oil and gas facilities, delivering the quality and frequency of information to enable significantly improved decision making during operation to enhance the profitability of its clients’ operations. Permasense, the leading provider of remote monitoring solutions to the oil, gas and petrochemicals industries, has relocated its Houston premises to accommodate its expanding team. The UK-headquartered company, which launched its Houston operation last year, now employs a total of five people to service the Americas. Online corrosion monitoring in tandem with simulation modelling identified the root cause of corrosion in a crude unit overhead. The severe fall in oil price has hit the profitability of non-integrated Canadian oil sands producers harder than many sectors of the oil and gas industry. Permasense launches an enhancement to its successful range of wall-thickness sensors specifically for the upstream sector. Permasense will be showcasing their products at OTC 2016 in Houston, Texas, US. Permasense will be participating at a number of events worldwide during March and April. Permasense, the leading provider of corrosion and erosion monitoring solutions to the global energy industry, has opened a base in Kuala Lumpur, Malaysia, to serve the Asia-Pacific region. Say-Heng Ng has been appointed as president of Permasense Asia-Pacific to lead the operation. Permasense, the leading provider of remote corrosion and erosion monitoring solutions to the global energy industry, has announced stellar growth results for 2015 with revenues totalling $10m, a 35% increase year-on-year. Permasense, a leading provider of remote monitoring solutions to the global energy industry, has secured its 100th customer. Permasense will be exhibiting its continuous corrosion-monitoring sensors at Offshore Europe 2015. Offshore Europe is one of the worlds largest technical conference and exhibition for the offshore E&P industry. Permasense, the leading provider of remote monitoring solutions for the global energy industry, has appointed a local agent for Australia, New Zealand and Papua New Guinea. Following the launch at OTC 2015 of the Permasense ET210 system that makes installation of continuous corrosion and erosion monitoring systems into upstream environments particularly easy, Permasense has opened an office in Aberdeen, UK, dedicated to serving customers in the upstream oil and gas sector. Leading provider of continuous integrity monitoring technology wins milestone order. Permasense, the leading provider of remote monitoring solutions to the global energy industry, today launches a new product for the real-time integrity monitoring of upstream oil and gas assets. Permasense will be speaking and exhibiting at NACE UAE Corrosion Conference taking place between 12 and 14 May 2015 in Abu Dhabi, UAE. The Offshore Technology Conference is the offshore energy industry's premier global event and is where energy professionals meet to exchange ideas and opinions to advance scientific and technical knowledge for offshore resources.